It was a historic winter for UM-Flint—and Flint itself. After 25 years, the University of Michigan-Flint did what some thought would never be done: It reopened the downtown Flint ice rink. The reaction was swift and immediate: Hundreds came to the grand opening festivities and it continued to draw crowds throughout the winter. Hundreds came out to the grand reopening of the ice rink. “As we continue to find ways to enhance campus, opening this rink is a simple way to have dramatic impact,” UM-Flint Chancellor Susan Borrego said in December when announcing the reopening of the rink. Throughout the year students as well as community members could be found enjoying the rink, nestled right along downtown Saginaw Street next to the UM-Flint pavilion. The rink is, and will continue to be, welcoming to all, as the Crystal Fieldhouse offered a skate rental program for anyone dropping in or passing by without skates. For one student, in just one year, going to the rink became a tradition. Twice a week this winter, DaKeitha Bennett, a UM-Flint graduate student and Event and Building Services employee, worked at the newly re-opened university ice rink Wednesday nights and Saturdays. Part of her new tradition was listening to happy skaters, who were pleased the rink was back. The rink first opened in 1985 as part of the Water Street Pavilion. 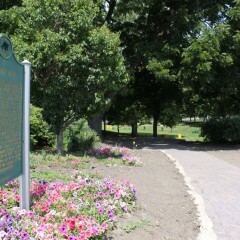 The rink closed before the University announced it would take ownership of the adjacent building, which is now the University Pavilion. The rink rekindled old traditions and sparked new ones. 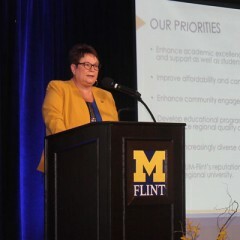 Theresa Landis, director of the UM-Flint Recreation Center, said she was pleased to see people take advantage of the rink. The rink opened Jan. 2 with support from both Kettering University and the Hagerman Foundation. It hosted free open skating Wednesdays, Saturdays, and Sundays and drew faculty, staff, students, and community members. The rink averaged more than 180 skaters every Saturday through early March when it closed because of warm weather. “We rented 706 pairs of skates this first season,” Landis said. “And that doesn’t count the many individuals who brought their own. 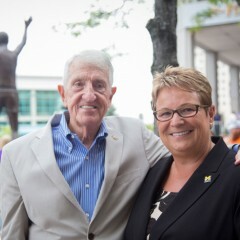 I was pleasantly surprised by the number of people who had their own skates,” Landis said. The university used the rink during other hours, as well, including a Student Government sponsored Valentine’s Day Skate and an intramural Broomball Tournament. It also succeeded in drawing groups and families, Landis said. 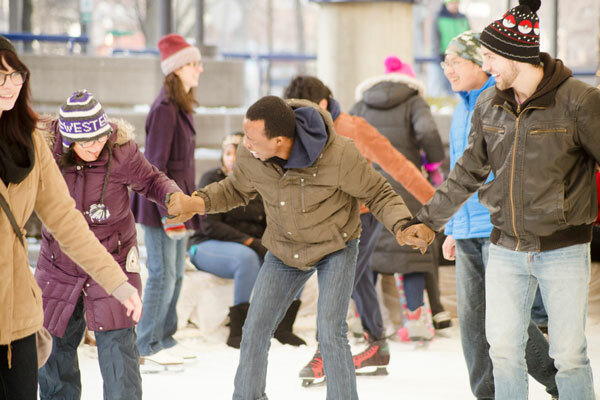 “We were thrilled by the number of families who came out to the open community skate times. 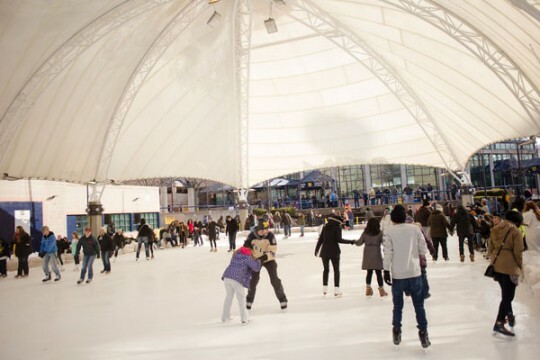 Many of the adults who brought their children to skate told stories about how they skated on the rink when they themselves were children,” she said. Bennett, born and raised in Flint, said she is glad the rink has returned. 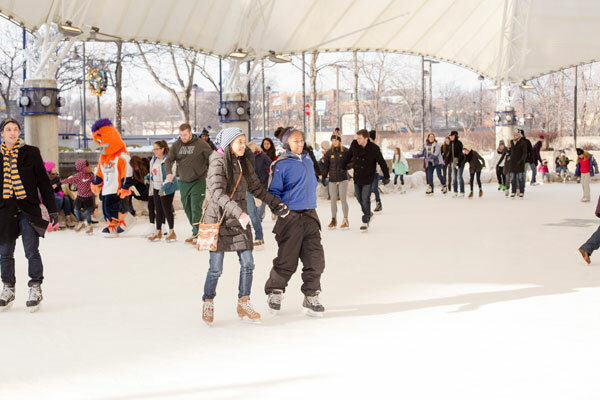 Check out UM-Flint’s Facebook photo gallery of the ice rink’s first winter in 25 years.